The DUP, for those unaware, are one of the most extreme political parties anywhere in Europe. They sit on the far-right of the political spectrum. Indeed, speaking figuratively, they are so far to the right of the spectrum you would have difficulty locating them with binoculars. They are a party with concrete historical links to loyalist paramilitary groups in the North of Ireland — i.e. terrorists — and their ranks are made up of assorted homophobes, Islamophobes, creationists, and cranks of every stripe. As such, dragging such a party into the heart of government is akin to dragging ghouls from their coffins into daylight. 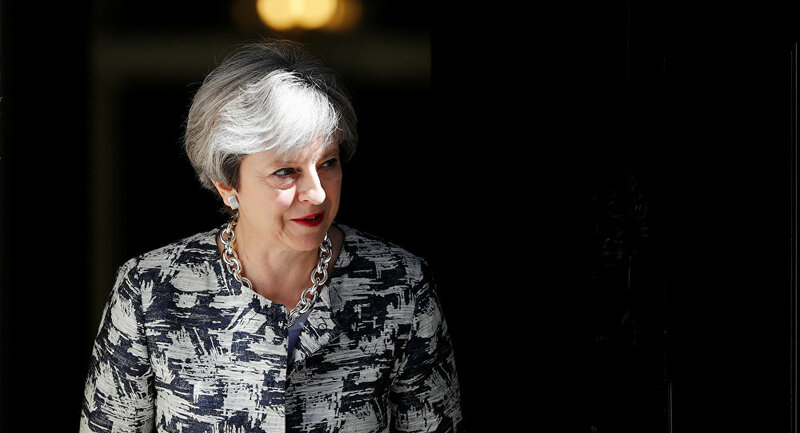 The unedifying sight of May doing whatever she can to cling onto power after a general election in which she lost her parliamentary majority — clinging on with the last particle of her expensively varnished fingernails, no less — induces bathos and pathos in equal measure. It is exacerbated by the fact that not only does she no longer command any authority in the country or in the UK parliament, she doesn't even at this stage command authority within her own party or cabinet. In essence, she is the very definition of a lame duck prime minister. The £1 billion (US$1.2 billion) that the DUP will receive for agreeing to ensure that its 10 MPs in the House of Commons vote with the government in order to get its legislation passed, this is a bribe by any other name. It serves to bolster the standing of the DUP at a time when the Northern Ireland Assembly, the organ of the province's devolved government, remains suspended in the wake of Sinn Fein's refusal to support it while Arlene Foster, First Minister of Northern Ireland and leader of the DUP, refuses to step down while a public inquiry is carried out into a publicly funded renewable energy scheme mired in allegations of corruption. What we have, as a result, is an on-going suspension of the power-sharing agreement between the mainstream republican/nationalist party in Northern Ireland, Sinn Fein, and its loyalist/unionist counterpart, the DUP. Throw into the mix Brexit, bringing with it the prospect of the re-establishment of a hard border between the Irish Republic in the south, which remains an EU member state, and the six counties of Northern Ireland, which as part of the UK is being wrenched out of the EU despite the majority of its people voting to remain in the referendum that was held on the issue one year ago, and the Northern Ireland Peace Process was already in jeopardy. 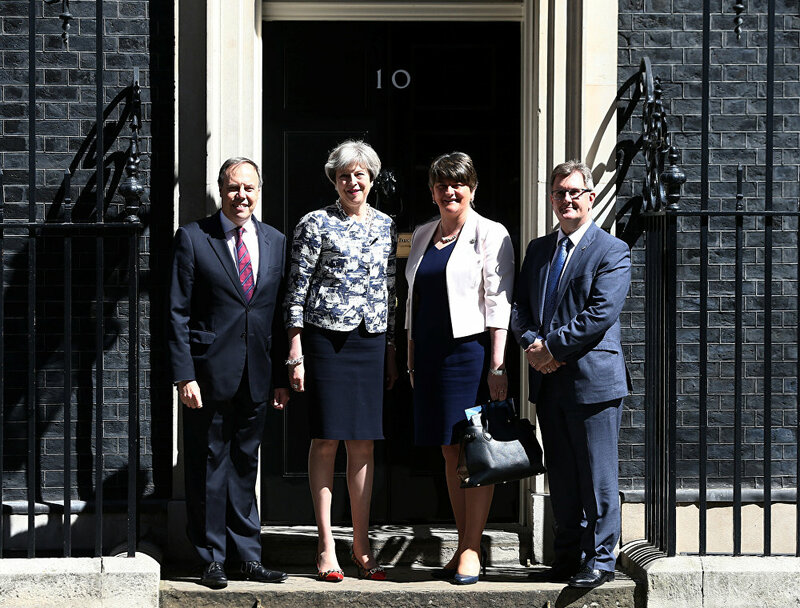 May's pact with the DUP only deepens the crisis engulfing the peace process, in that it violates the neutrality of a sitting British government when it comes to its dealings with the province. 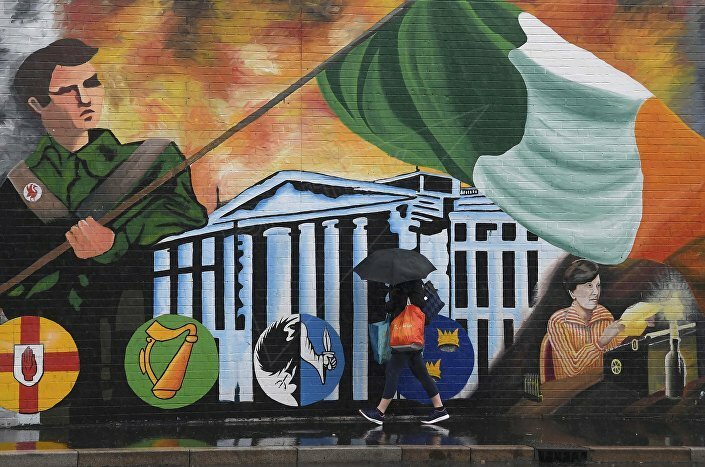 Given that this neutrality is enshrined in the Good Friday Agreement itself, the 1998 agreement that brought an end three decades of conflict in the province commonly known as the Troubles, and the UK finds itself in uncharted territory without a compass. A woman walks past a political mural in the Falls Road area of west Belfast, Northern Ireland, February 28, 2017. The proximate cause of this political and constitutional morass is the aforesaid Brexit. Ironically, rather than bolster the UK's standing in the world, as supporters of the UK's exit from the EU argued it would, Brexit has only pushed the country off the edge of an economic, political, and constitutional cliff without a landing anywhere in sight — and certainly no soft landing. Such are the wages of hubris that had allowed Brexit's staunchest advocates within the British political and media establishment to believe that if only the country could escape the clutches of the EU, it would return to its former status as a pillar of the world's economic, geopolitical, and geostrategic architecture in its own right. Sadly, for them, reality bites; and the reality in 2017, where the United Kingdom is concerned, is that without its membership of the single market, the largest tariff-free market in the world with over 500 million consumers, and with the prospect of losing the trade and investment the country enjoyed as a member of the European Union, the British people are looking at paying a heavy economic price for its "freedom" from Brussels going forward. "Whom the gods would destroy they first make mad." Labour leader Jeremy Corbyn, meanwhile, who spent the past two years being roundly panned and written off by the very same Tory political and media establishment — not to mention the vast majority of his Labour parliamentary colleagues — has since the general election found himself cast as the man of the moment; depicted, indeed, as a latter-day Clement Attlee, the renowned and revered Labour prime minister, who in 1945 rolled out the country's must vaunted welfare state, including the NHS. This is regardless of the fact that he actually lost the election. However, as everybody knows, in politics perception is everything, and the perception across the country is that Corbyn is the new prime minister in waiting. Given that during the general election campaign he was accused of being a "terrorist sympathizer" and supporter of the IRA, hypocrisy doesn't even come close to describing his accusers' silence in response to the UK Tory government's deal with the DUP.